Europium atoms have 63 electrons and the shell structure is 2.8.18.25.8.2. The ground state electronic configuration of neutral europium is [Xe].4f7.6s2 and the term symbol of europium is 8S7/2. Europium: description Your user agent does not support the HTML5 Audio element. Europium ignites in air at about 150 to 180°C. Europium is about as hard as lead and is quite ductile. It is the most reactive of the rare earth metals, quickly oxidising in air. It resembles calcium in its reaction with water. It is used in television screens to produce a red colour. 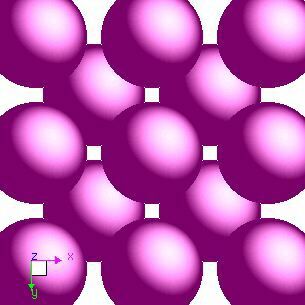 The solid state structure of europium is: bcc (body-centred cubic). Europium has no biological role. Reactions of europium as the element with air, water, halogens, acids, and bases where known. Binary compounds with halogens (known as halides), oxygen (known as oxides), hydrogen (known as hydrides), and other compounds of europium where known. Bond strengths; lattice energies of europium halides, hydrides, oxides (where known); and reduction potentials where known. Europium was discovered by Eugene Demarcay in 1901 at France. Origin of name: named after "Europe". Isotope abundances of europium with the most intense signal set to 100%. 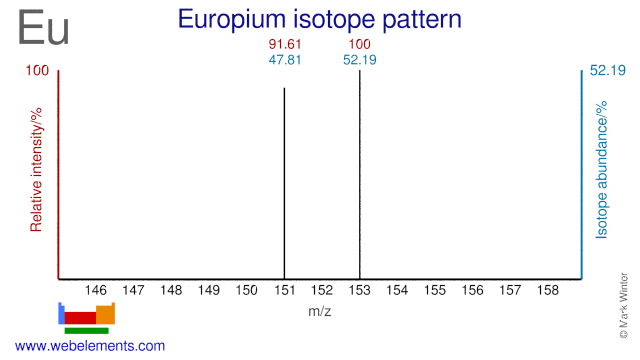 Europium has two stable isotopes and both are used for the production of radioisotopes. Eu-151 is used for the production of Eu-152 which is used as a reference source in gammaspectroscopy. Eu-153 can be used for the production of high specific activity Sm-153 via fast neutron irradiation. Isolation: europium metal is available commercially so it is not normally necessary to make it in the laboratory, which is just as well as it is difficult to isolate as the pure metal. This is largely because of the way it is found in nature. The lanthanoids are found in nature in a number of minerals. The most important are xenotime, monazite, and bastnaesite. The first two are orthophosphate minerals LnPO4 (Ln deonotes a mixture of all the lanthanoids except promethium which is vanishingly rare) and the third is a fluoride carbonate LnCO3F. Lanthanoids with even atomic numbers are more common. The most comon lanthanoids in these minerals are, in order, cerium, lanthanum, neodymium, and praseodymium. Monazite also contains thorium and ytrrium which makes handling difficult since thorium and its decomposition products are radioactive. 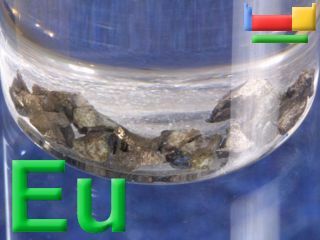 Pure europium is available through the electrolysis of a mixture of molten EuCl3 and NaCl (or CaCl2) in a graphite cell which acts as cathode using graphite as anode. The other product is chlorine gas.